I wrote the post below on Thursday (1/11/17), but didn’t have a chance to type it up until today. Once I transcribe and post it, I’m gonna start work on the post that would usually go up today, which will be scheduled to post tomorrow morning. 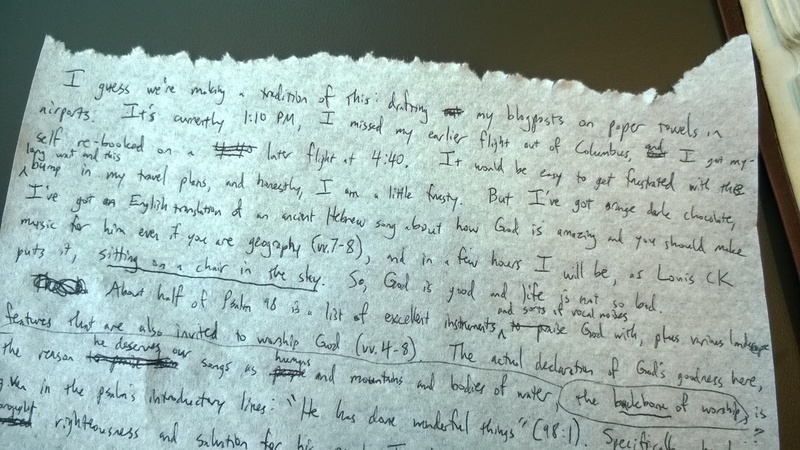 I guess we’re making a tradition of this: drafting my blogposts on paper towels in airports. It’s currently 1:10 PM, I missed my earlier flight out of Columbus, and my re-scheduled flight doesn’t leave until 4:40. It would be easy to get frustrated with the long wait and this bump in my travel plans, and honestly, I am a little bit frusty. 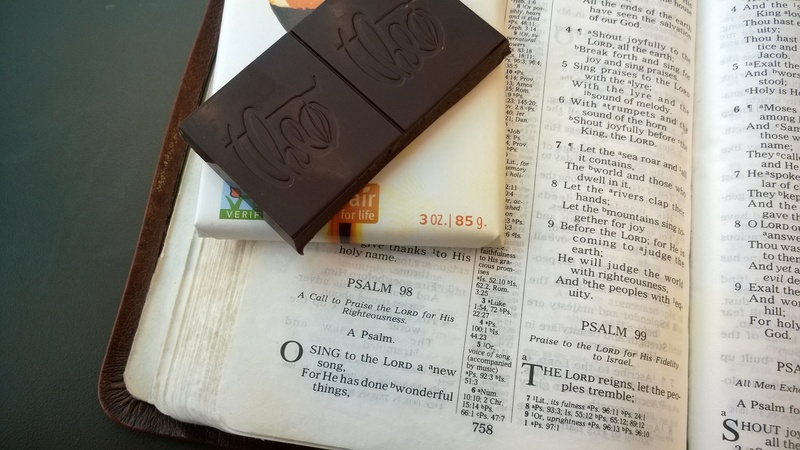 But I’ve got orange dark chocolate, I’ve got an English translation of an ancient Hebrew song about how God is amazing and you should make music for him even if you are geography (vv.7-8), and in a few hours I will be, as Louis CK puts it, sitting on a chair in the sky. So, God is good and life is not so bad. About half of Psalm 98 is a list of excellent instruments and sorts of vocal noises to praise God with, plus various landscape features that are also invited to praise God (vv.4-8). The actual declaration of God’s goodness here, the backbone of worship, the reason he deserves our songs as humans and mountains and bodies of water, is given in the psalm’s introductory lines: “He has done wonderful things” (98:1). Specifically, he has brought righteousness and salvation for his people Israel. The psalmist says, “The Lord has made known His salvation; He has revealed His righteousness in the sight of the nations” (98:2). God has displayed how great he is, not just before Israel but also before foreign nations, by performing saving acts of justice in Israel’s history. God is revealing himself in what he does, and absurdly, this verse brought to mind the line from the Big Lebowski: “New [expletive deleted] has come to light.” The Big Lebowski is not an especially theological movie. Absurdity of my random mental connections aside, this psalm raised a question for me. Where has God more fully revealed his salvation than in the life, death, and resurrection of Jesus Christ? Yet the psalmist wrote this centuries before Jesus Christ came to light–so did the psalmist have the Messiah in mind as he penned these verses? I honestly don’t know. But the psalmist knows that God has been in the business of saving people throughout history: saving Noah’s family from the flood, saving his chosen people from slavery in Egypt, even saving non-Israelites like Rahab from his judgment. Even if the psalmist didn’t consciously anticipate Jesus Christ as the crucial agent of God’s salvation, I still think that to learn that God came to earth in the flesh, living and dying and rising again to save humanity from their sins, would come as no surprise to him. God saves: that’s what he does, and that’s what makes him worth singing to. Posted in Daily Reading, Exodus, Genesis, Joshua, Old Testament, Psalms.Tagged bible, christianity, God, Israel, Jesus, Psalms, righteousness, salvation, scripture, worship.